We all want to do good — contributing financially to our favorite charities is a great way to do so. But what if our donations could do more good for the organizations we love and the causes we care about? Even better, right? 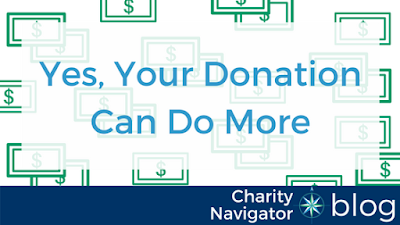 At Charity Navigator, we’re passionate about helping you give confidently to the charities you love, knowing your gift will have an impact on the cause you care about. In addition to our charity ratings, we have lots of giving tips to empower you to give better through your donations. There are more than 1.5 million charities in the United States, which means there are a lot of opportunities to support organizations doing important work, and if you’re like me, that can be pretty overwhelming. Good news! You don’t need to worry about supporting them all. Your support can be more effective if you choose a couple of organizations to support with larger gifts, rather than supporting more organizations with smaller gifts. Identify the cause—or causes—you care the most about. Zoom in on your cause area of interest and create a list of organizations working on that issue (our Advanced Search Tool is a great resource for this). From that list, choose a couple of charities whose work aligns closest with your interests. Perhaps you are more interested in seeing hunger addressed at the local level rather than at a national level. If that’s the case a local or regional foodbank may be a better outlet for your support. For less than the cost of a cup of coffee each month you can _____. Why can we all fill in the blank with at least five different actions for different organizations? Because this pitch works. Not only is it catchy, but there is also real value to an organization in moving donors from making annual gifts to making quarterly or monthly recurring donations. Every organization sees a spike in support at the end of the year when donors are in the holiday spirit or thinking ahead to tax season. Like any business, however, organizations have expenses throughout the year. A dependable stream of monthly revenue enables them to build stronger budgets and continue their work throughout the year. Generally, monthly giving generates more revenue per donor for the organization. A donor may give a $50 annual gift, but if they opted to make a $5 monthly gift the organization would receive $10 more over the course of the year. That’s more revenue for the organization and a lighter lift for the donor throughout the year. And, because charities recognize and value the commitment of their recurring donors, they often offer “perks” to this group. These can range from exclusive newsletters to event invites to promotional goods, like pins or tote bags. When choosing your organizations to support, make sure the organization has committed to solving the problem you’re passionate about. Because of this commitment, consider becoming a financial partner for this organization for the long-haul. Whether you’re giving $5 a month or $500 a year, your continued support of an organization ensures that they are able to find creative solutions for the issues you care about. Building relationships with organizations is another foundation to creating transformational actions. For even more ideas on how to be a more informed and impactful donor, check out our Five Steps to Informed Giving. These simple steps will transform the way you think about your charitable giving and increase your impact on the causes you care about. And remember, these ideas aren’t just for donors with the ability to make a gift with lots of zeros at the end. 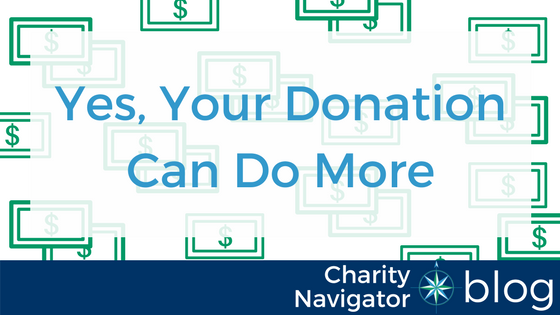 These tips will help your donation, whatever the size, do more good for the charity you love and the cause you care about.